Literally just laughed out loud. OH my gosh. Best. Picture. Ever. Thanks, Grace. That was the only/best ab workout I had all week. SO. FUNNY. 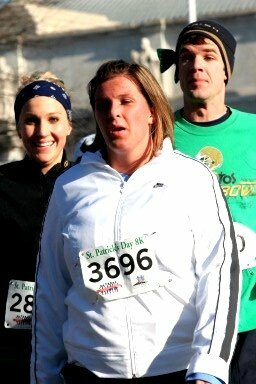 Greatest race photo I have ever seen. hahah this is SO funny!!!! that lovely lady in the front, she looks thrilled to be there. Simon's bow is beyond awesome. you look happy, happy, happy! This photo made my morning. And Simon can really rock a head bow, btw. That last one did it for me. I only guess at the tragedies that may or maynot have happened while I was gone. I couldn't get anything out of my husband, yesterday...even though I left him with the twins for two hours..hmm. favorite pic of all time.